As promised a couple of days ago, here is the short and skinny on the workshop I took this past Saturday. It was called "I'd Rather Be in the Studio." The speaker was Alyson Stanfield from the Denver area. Her blog and newsletter have been a daily read of mine for about 2 years (give or take). Her website is ArtBizCoach.com and her blog is ArtBizBlog.com. She helps artists to become more focused in their business and marketing needs. 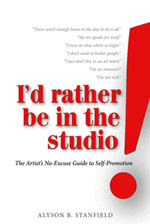 Her new book of the same name, "I'd Rather Be in the Studio," was just released and made its debut at this workshop. Yep, I bought one and she even signed it. Learned that your mailing lists need to be up to date, be technologically adept or hire someone who is by getting a website and a BLOG! Well, two out of three ain't bad. Gotta work on that mailing list thingy! The workshop was put on by the Deer Path Art League at the Gorton Community Center in Lake Forest, IL. It's one of those north shore suburbs...old money and beautiful. I used to work there in the late 80s and both my daughters were born there. I met some great, talented people that day. The workshop was also something totally out of my comfort zone since I didn't know a soul. Forces you to stretch your wings and reach out. Unnerving at times, but necessary. Oh, and getting a Garmin GPS unit for my husband for Christmas, was another way of getting me to drive somewhere out of my comfort zone. Jeff probably thinks that gift wasn't really for him! The little lady in the Garmin guided me all the way to the North Shore in absolutely horrible weather. Once we sell the restaurant and inn, I hope to delve more into the business and promotional side of my art. I promise. Really.